Do You Have Room for your Wisdom Teeth? Wisdom teeth, often called third molars, usually erupt between the ages of 17 and 22…if they are going to erupt. They are called “wisdom” teeth because they come in when a person is older and supposedly “wiser.” Approximately 20% of the population have one or all of their wisdom teeth congenitally missing. This is a term called hypodontia, meaning fewer teeth than normal. Conversely, some have extra wisdom teeth called supernumeraries which in most cases are smaller in size. This author has removed as many as four wisdom teeth in one area–one natural and three supernumeraries. There are many classifications of wisdom teeth based upon their position in the jaw bone. 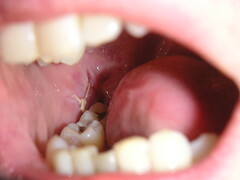 A general classification is an impaction, or failure of the tooth to erupt. This may be caused by either the tissue, the bone, or the second molar just in front of the wisdom tooth. The consensus is that all wisdom teeth which are impacted should be removed. In general, upper wisdom teeth can be removed easier than lower wisdom teeth as the density of the upper bone is less. Partially erupted wisdom teeth often cause discomfort because food debris may become lodged under the gum tissue on top of the tooth. This will cause swelling and infection which may be compounded by the opposing wisdom tooth biting into the sore tissue. The preferred treatment is to remove this tooth. A wisdom tooth may also be removed to preclude the formation of a cyst at the root top or around the crown of the un erupted tooth. On a rare occasion, an operculectomy (removal of the offending tissue only) might be performed. A few wisdom teeth do not require extraction. If so, the patient must be cognizant of the absolute necessity to keep both the tooth and tissue absolutely clean and hygienic. Also, orthodontic patients who have had their first bicuspids removed during treatment sometimes have enough room to allow for wisdom tooth eruption. For patients who are athletes and subject to trauma or blows to the lower jaw, the third molar creates a weak place in the angle of the mandible. This makes the mandible much more readily broken. Removal of the wisdom tooth allows for solid bone to replace it in this area and provides a lesser chance of jaw fracture. Also, if the wisdom teeth have erupted enough, it is often desirable to remove them prior to having problems and prior to full root formation. This tremendously lessens the chance for the minor possibility of nerve damage during extraction.